Doppler radar detected Egg size hail near Fountain, CO on June 13, 2018. This hail storm was traveling SE at 8 mph and the entire storm produced hail for roughly 1 hour(s). There were 14 spotter report(s) with reported max hail size of 3″ and an average hail size of 2.25″. We estimate that 10,858 buildings were in the affected area and the probability of hail DHI detected was significant. Based on this information, you can expect to find damaged crops, glass damage, automobile bodywork damage, as well as isolated roof damage (Impact Rating 3). 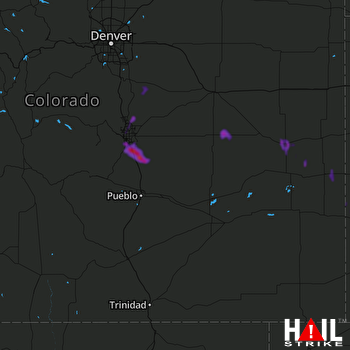 Doppler radar detected Egg size hail near Fountain, CO on June 13, 2018. This hail storm was traveling ESE at 8 mph and the entire storm produced hail for roughly 3 hour(s). There were 14 spotter report(s) with reported max hail size of 3″ and an average hail size of 2.25″. We estimate that 12,275 buildings were in the affected area and the probability of hail DHI detected was significant. Based on this information, you can expect to find damaged crops, glass damage, automobile bodywork damage, as well as isolated roof damage (Impact Rating 3). 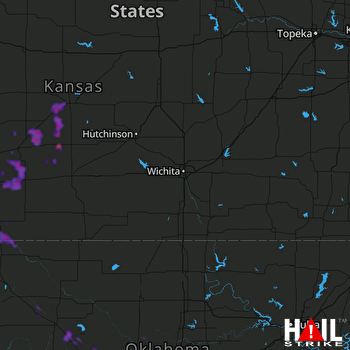 Doppler radar detected Ping Pong Ball size hail near Great Bend, KS, Kinsley, KS and Bucklin, KS on June 12, 2018. This hail storm was traveling E at 11 mph and the entire storm produced hail for roughly 1 hour(s). There were 15 spotter report(s) with reported max hail size of 2.75″ and an average hail size of 1.72″. We estimate that 15,969 buildings were in the affected area and the probability of hail DHI detected was significant. Based on this information, you can expect to find damaged crops, glass damage, automobile bodywork damage, as well as isolated roof damage (Impact Rating 3). 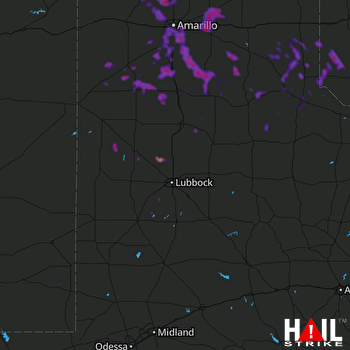 Doppler radar detected Ping Pong Ball size hail near Amarillo, TX, Hereford, TX and Canyon, TX on June 13, 2018. This hail storm was traveling NNE at 3 mph and the entire storm produced hail for roughly 7 hour(s). There were 9 spotter report(s) with reported max hail size of 2.5″ and an average hail size of 1.5″. We estimate that 41,298 buildings were in the affected area and the probability of hail DHI detected was significant. Based on this information, you can expect to find damaged crops, glass damage, automobile bodywork damage, as well as isolated roof damage (Impact Rating 3). Doppler radar detected Half Dollar size hail near Liberal, KS, Great Bend, KS and Ulysses, KS on June 12, 2018. This hail storm was traveling NE at 4 mph and the entire storm produced hail for roughly 1 hour(s). There were 15 spotter report(s) with reported max hail size of 2″ and an average hail size of 1.35″. We estimate that 46,575 buildings were in the affected area and the probability of hail DHI detected was significant. Based on this information, you can expect to find damaged crops, glass damage, automobile bodywork damage, as well as isolated roof damage (Impact Rating 3).